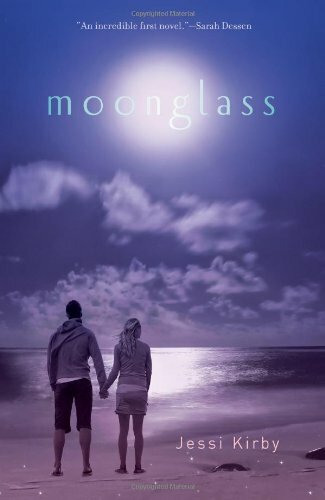 After having read and loved Jessi Kirby’s debut novel, Moonglass, I was eager to read Golden. I’d been hearing nothing but glowing things about it, and how it was affecting people on an emotional level, so I couldn't wait to dive into it and experience it for myself. I'm glad to say that this book is worth every bit of the hype surrounding it. Parker has lived her entire seventeen years doing what was expected of her. She’s been a good student, hasn’t gotten in trouble, and has tried to please her mother by living up to her incredibly high standards. When she finds the journal of a girl who died ten years before in a car accident and discovers that her perfect life wasn’t really as it seemed, Parker begins to question not only her own life, but the accident that killed her town’s golden couple. What follows is a story that encompasses all the best things about contemporary young adult - self-discovery, friendship, romance, adversity, change, a mission for the main character to focus on - as well as elements that make Golden unique, like its mystery. Parker reminded me of myself in so many ways. While I wasn’t as driven as she was in high school, I was still the type to always try to do the right thing, make people happy, not rock the boat, not speak my mind. I understood Parker’s realization and then regret about letting things pass you by because you’re too afraid, too shy, too worried about the consequences or being embarrassed or getting hurt. Her personality, her inner dialogue, her reactions and revelations, all really resonated with me and felt completely genuine. I was invested in her story and in her success, and I wanted to see her burst out of her self-imposed bonds and really live, which is exactly what she did. Golden is the type of book that quietly creeps into your heart and makes you feel every little bit of it. It poses questions - what is it you plan to do with your one wild and precious life - it makes you think not only about the choices you make and how each decision can affect your future, but it also makes you stop and evaluate your life, where you’re going, what you want. When faced with those big questions, Parker realized she wasn’t happy with the direction her life was taking, and she set out to change it, even if she didn’t quite realize at first that that was what she was doing. She broke rules, did things for herself, took chances, and I loved every minute of her journey. Just like every good contemporary YA book, Golden is about change. It has this almost bittersweet feeling to it at times. Maybe it’s because I’m older than the characters and my high school years are far behind me, and even though Parker’s story was different from mine, it felt like getting a glimpse into the past and seeing your own life as it was at seventeen, with huge changes on the horizon. Parker’s changing relationship with her mother, her best friend, her love interest, even herself, are both beautiful and poignant, while also making your heart ache. I can remember my last year of high school and thinking nothing would change between my best friends and me, but nothing was ever the same after high school, and Parker’s best friend knew that. I also loved the thread of romance throughout the story. It was understated but so well done. It almost took a backseat to the romantic element of the mystery Parker was trying to solve, but I enjoyed every one of Parker and Trevor’s interactions, the slow burn of it, the will they/won’t they feeling of anticipation. This was a love story in so many ways, and it left me feeling satisfied and happy. Plus Trevor had some pretty swoonworthy moments. In a way I wish we'd seen more of him, and yet the way it was done was perfect and I wouldn't change it. If you enjoy contemporary young adult, read Golden. If you enjoy coming of age stories, read Golden. If you enjoy stories about self-discovery, read Golden. If you enjoy a good mystery that will keep you guessing while holding you completely captivated, read Golden. Basically you just need to read Golden. Beautifully written and engaging, with the ability to both warm and break your heart, I defy anyone to read this story and not come away changed in some way. Have you read Golden? What did you think? Do you know what you want to do with your one wild and precious life? Have you read either of Jessi's other books (Moonglass and In Honor)? Ugh, this review gave me chills, Marie. You took all the struggling I did writing mine and somehow you said what *I* wanted to say. Beautiful review for a gorgeous book. I am so happy you shared some quotes, too - this will encourage more people to read Golden hopefully! My copy needs to hurry up and arrive already! I'm on pins & needles here. I saw this book on another blog for the first time today, also a 5 star review and instantly added it to my TBR pile - I''m am so pleased to see you enjoyed it as well Marie, it sounds truly wonderful!